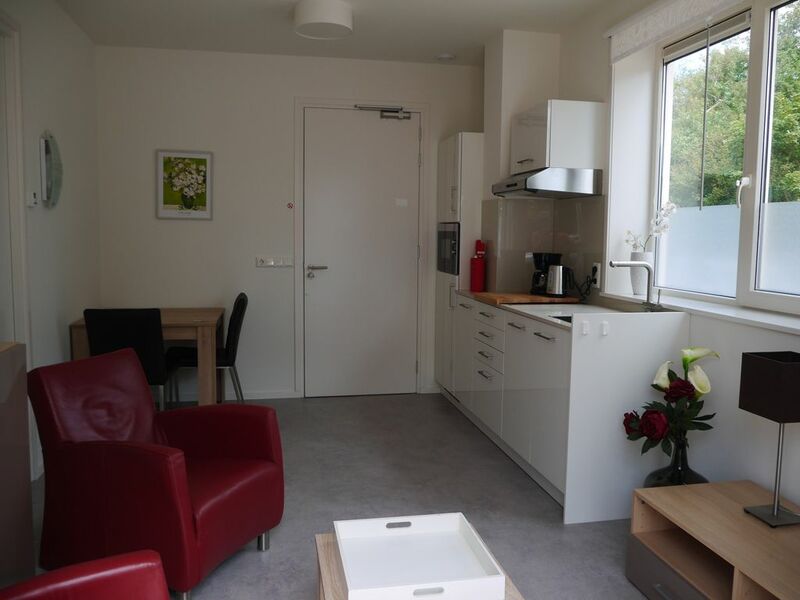 Apartment for 2 persons on the ground floor. Terrace with furniture at the south side overlooking the lighthouse. Living room with kitchen and seating area. The kitchen is fully equipped with Dish washer, Microwave, Inductionkochplatte, refrigerator with freezer, coffee maker, kettle, etc. Bedroom with box 1. 80 x 2. 00 m. Nice bathroom with shower, toilet and sink. Fi and cable TV with international channels are available. The whole apartment is underfloor heating. Includes bedding. Bicycle and washing machine are available! Cozy apartments, all brand new! Self-catering. Free Wi-Fi. The 3 apartments and the studio are quietly located at the Dorfrand with beautiful view of the lighthouse. The apartments all have a cozy living room, cable TV with German channels and comfortable armchairs. Very fully equipped kitchen with induction cooker, microwave, dishwasher, coffeemachine, water cooker, etc. Each apartment has a nice bathroom, and bedroom with new box springs. Terrace or balcony with furniture. The apartments all have their own tasteful decor, all are separate from each other. Apartment 1 has a nice terrace on the south side with Möbilair, Apartment 2 has a small balcony on the south side with open large glass doors you sit there gorgeous in the sun, Apartment 3 has a very nice roof terrace. Studio for 2 persons, 1-room apartment with fully equipped kitchen, dining table, seating corner, big boxspring and nice bathroom. The studio has no outdoor area. Cable TV with German channels. Zum zweiten Mal da und immer wieder! Schönes modernes Studio mit kleiner Terasse, gut bestückt mit allem was man braucht. Nette Vermieter und ruhige und trotzdem zentrale Lage. Alles sehr gepflegt und hochwertige Ausstattung. Ein Türstopper für die Terassentür hätte die Wohnung komplettiert. The apartments are beautifully situated, below the lighthouse of Westkapelle. On top of the lighthouse, they have a very nice view over the whole Walcheren and over the sea. In the lighthouse, various exhibitions.